So a few months ago I started seeing these gorgeous, but very usual looking braids popping up all over the runways and along my fellow bloggers. I was so intrigued by the the beauty of these unique looking braids, and just HAD to see what exactly they were. My research came up with what I was looking for: the braids were called Fish Tail Braids. 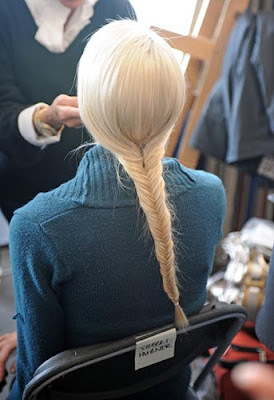 A fish tail braid is actually much more simple to create than it looks. At first I thought, "Oh my goodness,it must take a professional stylist to do this complicated looking braid!" That is certainly not the case. I researched how exactly to do a fishtail braid and watched many different tutorials to get a feel for how to do them! I was so stumped at first on how to do the braid, but after messing around with my hair awhile and re watching the videos I got it down pat! Ever since I've learned how to make a fishtail braid I have been doing them on everyone....myself, my sister, my mom. Heck, if Matt had longer hair I would try and do one on him! Ironically enough I've never posted pictures on this blog of my hair in a fishtail braid, but will have to do so very soon! The only problem with my hair is it's not quite long enough for the braid to look the way I want it to. I want my hair to be super long so bad!! :( The braid looked fabulous on my mom and little sister's longer hair, so I hope that mine will grow fast so I can have a big, thick, and long fishtail braid hanging over my shoulder soon! Here's just a little step by step process on how to do a fishtail braid. However, I highly suggest watching a tutorial online after. They are much easier to understand than written instructions! Start with wet hair. 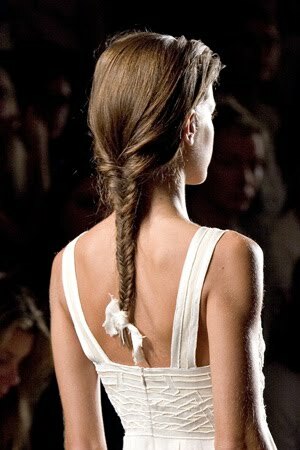 It is easiest to do a fish tail braid when hair is wet so that it can be tight and if you have layers in your hair they will stick together easier. Also, a benefit to doing a fishtail braid with wet hair is that all of those annoying fly away and frizzy hairs are nonexistent! It's a good suggestion, but not a requirement to put in a styling/ holding gel into your hair before braiding. This will make it so that the braid stays together throughout the day! First part your hair into two large sections. Next, Take a back piece from the right side of hair and cross it over and put into the left side of hair. Pull the hair tightly so to eliminate bumps or gaps. Then, take a piece of hair from the back from your left side of hair and cross it over putting it into the right side. Keep pulling hair tightly throughout this process. The pieces you are crossing with can be as small or large as you would like them to be. Larger pieces will create larger "fish scales" whilst smaller pieces will created more intricate and smaller "fish scales"
Continue crossing the pieces of hair back and forth until you reach the end of your hair where you tie a small elastic rubber band at the bottom. Wa-la! It's as simple as that! If you have layers or slightly shorter hair like myself, use bobby pins to pin the loose hair into the braid. I quite like the messier fishtail braids more so than the neat and tidy ones, so for a messy fishtail pull the braided hair slightly out to roughin' it up a bit! I've found that sleeping in my fishtail braid overnight also gives it that roughed up effect! Hope everyone is doing well! It seems that this week is dragging on forever... Friday please get here! Outfit posts will resume tomorrow. I've got a girly and cute-sy outfit laid out! :) See you all tomorrow. Thanks so much for your lovely comments! You all are the best. Oh Yes... this braid is one of my favorites. I'm sure it'll look lovely on you. I <3 fishtail braids! There was a good tutorial in Cosmo last month about these typs of braids. So wish my hair was long enough to do this! I think its so adorable!